I’m not quite sure what to make of ‘Paterson’, the latest film from American indie director Jim Jarmusch. It’s a slow, meditative story that follows one week in the life of a bus driver (Adam Driver) from Paterson, New Jersey, with no real major events throughout the course of the film. To dismiss it on this basis does ignore the intricacies it explores, such as the nature of routine, the artist inside all of us, and there are many small joys in watching each day pan out, much the same as the one before. It helps that Jarmusch has the exceptional Adam Driver to anchor this movie of small moments and small gestures; ever since I’d first seen him on HBO’s ‘Girls’, he’s been the best thing in most of his appearances and he continues this winning streak in one of his first leading roles. Each day follows a similar pattern, as Paterson (Driver’s character has the same name as the town he lives in) gets up, goes to work, notes down thoughts for poems on his breaks and comes home. Even his nights have a routine to them as he takes their dog Marvin for a walk and drops into a local bar for a drink. Surrounding this routine is where the film has the opportunity to be interesting as we observe the characters and situations that interact with Paterson, and often give him material for his poetry. Most of the comedy in the film comes from the bar he frequents most nights, ran by Doc (Barry Shabaka Henley) and inhabited by a variety of patrons with their own interesting stories that Paterson drops in and out off. Henley is the best of the supporting cast (unless we’re including the wonderful Marvin!) as a world weary landlord and he clicks with Driver in a way some of the other characters don’t. One of those problems is with his partner Laura (Golshifteh Farahani), and I couldn’t tell if the issue was with the actress’s performance or the character herself. Laura is a live at home artist with grand ideas about the future and she regularly encourages Paterson to pursue his poetry. The snippets of his poetry that we are shown aren’t particularly great and I wasn’t sure whether this was part of the point Jarmusch is trying to make, in that not everyone can be an artist and not everyone’s attempts at art are worthwhile but if we get enjoyment out of it then that’s a good thing. Or does he genuinely think the snippets are good and therefore believe everyone should pursue their goals or dreams? ‘Paterson’ floats a lot of interesting ideas but I felt it lacked the clarity to get across what it wanted to say, and whilst opaqueness is not a bad quality inherently, I felt ‘Paterson’ lacked a little in this regard. The film’s positives do all comes back to the importance in casting Adam Driver, an actor who conveys a lot in small expressions and this is crucial in helping to bring a largely passive character to life. 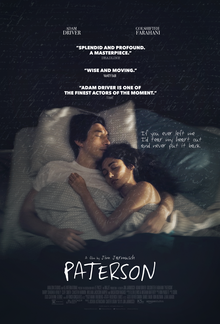 ‘Paterson’ is an OK movie with a great Adam Driver performance, but it’s a film I struggled to get a handle on and it never fully engaged me despite a watchable cast and some interesting themes.